Colorado, the centennial state, has a rich history, first as home to many native American tribes, then as a destination for settlers, traders, hunters and gold seekers. 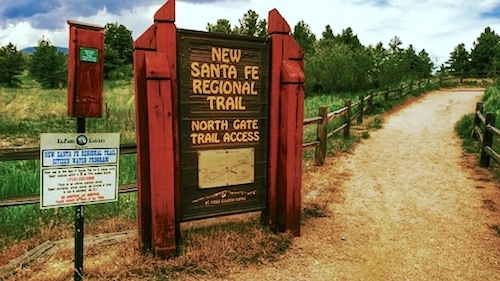 The Santa Fe Trail - The southeast corner of the state is rich in history is home to the famous Santa Fe Trail which brought many people west during the 19th century passing through Colorado along the Arkansas River. The Santa Fe Trail saw heavy use during this time moving freight to stock the forts in the south west, as a route for wagon trains and stage coaches, and a destination for gold hunters during the Colorado gold rush. In 1880 the railroad reached Santa Fe and the trail faded into history. Much of the route now follows U.S. Highway 50 through Kansas and Colorado, and wagon ruts can still be seen in many areas along the route. Bents Old Fort - One of the most popular historic landmarks in Southeast Colorado is the site of Bent's Fort. Originally constructed in 1833 by William and Charles Bent and their partner Ceran St.Vrain, the fort became a center of the Bent-St.Vrain trading empire. For most of the next 16 years, it was the only permanent white settlement on the Santa Fe trail between Missouri and the Mexican settlements. After being used as a staging area for the Army of the West during the Mexican American War, the fort experienced disasters and disease. After attempts to sell the fort to the US Army failed, the legend is, William Bent simply blew it up. Between 1821 and 1880, the Santa Fe Trail was the primary highway that moved people and freight between Missouri and Santa Fe, New Mexico. Prior to 1846, the trail was an international route used by Americans and Mexican traders. In 1846 when the Mexican-American war broke out, the trail was used by the US Army to invade Mexico. After the Treaty of Guadalupe ended the war in 1848, the Santa Fe Trail became the major route used to connect Americans with their new territory in the southwest.